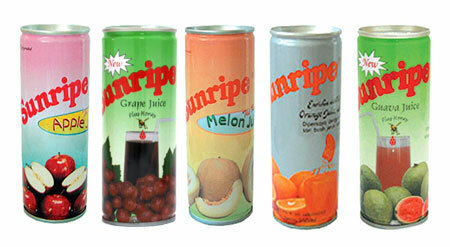 Sunripe fruit juices are made from selected fresh tropical fruits from Indonesia and imported fruit juice concentrates of America, Brazil, and Australia. 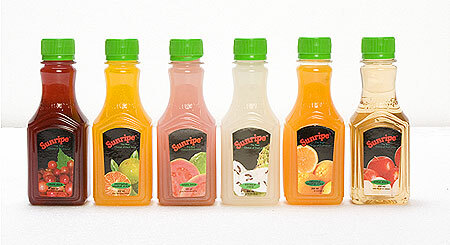 The following flavors are available in 1 L and 2 L bottle packaging: Pink Guava, Carrot Mix, Pontianak Orange, Pineapple, Lemon, Soursop, Orange, Orange unsweetened, and Apple. Also in convenient 200 ml bottles are our most popular flavors: Grape, Pontianak Orange, Pink Guava, Soursop, Orange, and Apple. Perfect for the minibar, these flavors are available in 250 ml cans: Apple, Grape, Melon, Orange, and Pink Guava. For hotels, restaurants and catering we also provide the following flavors in 1 L, 2 L, and 5 L bulk sizes: Orange, Apple, Pink Guava, Mango, and Carrot Mix. 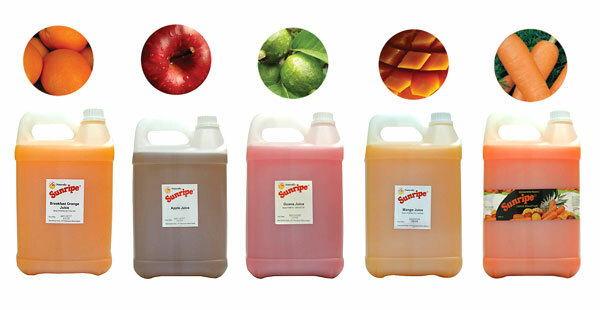 Beside ready-to-drink fruit juice, we also process juice concentrates of various strengths in 2 L and 5 L bottle packaging. The following flavors are available in concentrate form: Orange, Pink Guava, Apple, Pineapple, Soursop, Lychee, Strawberry, Lemon, Mango, and Lemon Tea. Sunripe ready-to-drink fresh juices are available in 250 ml can, 200 ml, 1 L, and 2 L bottles, as well as industrial packaging. Sunripe juice concentrates are available in 1:3, 1:4, 1:5, and 1:9 strengths. If you are interested in ordering any of these products in bulk, please take a look at our wholesale page. If you have your own juice products in mind and are looking for a reliable manufacturing partner, we can also formulate special flavors in customized packaging to your specific requirements. Kindly email us at oem@sunripe.com.sg with your interest and we'll get back to you shortly.